The Smart Home Race: Who Will Win? The main issues? Consumer confusion, which adoption follows. There is, unfortunately, technological fragmentation within the connected home ecosystem. Currently, there are many networks, standards, and devices being used to connect the smart home, creating interoperability problems (the ability of a system or a product to work with other systems or products without special effort on the part of the customer) and this makes it confusing for the consumer to set up and control multiple devices. Until interoperability is solved, consumers will have difficulty choosing smart home devices and systems. So here’s how different companies are approaching the market place. Some make it really easy for the customer, while others require a more technical approach. Tim Cook demonstrated how he uses Apple’s HomeKit in his personal life to give potential or current users some ideas on how they can apply it. During Cook’s quarterly earnings conference call he talked about how he has integrated HomeKit products, and the iOS 10 Home app, into his home routine. There are about 100 HomeKit-compatible products available. Ways to use Apple’s homeKit? When you wake up and say good morning to Siri, your house lights can be programmed to come on and the coffee machine can be started! Though there don’t seem to be any coffee makers on the market with integrated HomeKit support, it’s likely he may be using smart plug. There are plenty of HomeKit smart plug options on the market— AppleInsider has reviewed both the Elgato Eve Energy and iHome iPS5 SmartPlug. There are two options For HomeKit lighting: bulbs and switches. Philips Hue is a popular option bulb option. It comes in a starter pack with three bulbs and a HomeKit-enabled hub for ~$199.99. As far as switches go, the Lutron Caseta Wireless in-wall dimmer kit is HomeKit compatible. Like Philips Hue, it needs a hub to be connected to a home router for HomeKit support— the hub is included in the ~$190 bundle. Smart plugs are only useful with appliances that automatically turn on and operate when they are connected to an outlet. If the connected device requires any sort of manual input, HomeKit and Siri integration don’t work. Cook also mentioned that when he relaxes in the evening, he asks Siri to adjust the lighting and turn on the fireplace. And upon leaving the house, Cooks says by simply tapping on his iPhone, the lights turn off, the thermostat turns down and the doors lock. Using HomeKit to turn down the thermostat, a common device is the Ecobee3 second-generation model, ~$250. When it comes to door locks, you could consider the $215 Schlage Sense and $230 Kwikset Premis. These both have numeric keypad entry. The $230 August Smart Lock integrates with many existing door locks and makes for simpler installation. When Cook talks about the simple tap” on his iPhone, in “Apple language” he is creating a “Scene” with the Home app in iOS 10. What is a “scene?” An example is when Cook says his “Hey Siri, good morning” greeting, it turns on the lights and a smart plug to brew coffee. How does that work? 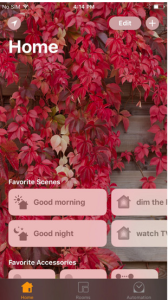 You’d open the Home app in iOS 10, tap the plus button in the top right, and simply choose “Add Scene.” Then you’d create a custom scene name and choose which accessories are powered on or off. For more on this, check out the AppleInsider. Why is Amazon considered by some to be at the helm of the smart home arena? Not only is Amazon cleverly locking customers into its wider Prime ecosystem, but Alexa adds additional value. It’s easy to set-up, on average about a minute or so. You just plug Echo it into a wall outlet using the included power adapter, wait for the spinning light ring on top to go from blue to orange and then Alexa will greet you. Amazon Echo is great if you just want to have a stationary speaker that doubles as an always-on personal assistant. It provides room-filling audio that’s good for casual listening. When it’s connected to Wi-Fi, you can ask it all sorts of questions and control your devices. But installation, troubleshooting, and setup of devices not included. Amazon Tap provides a similar sound experience, but uses a charging cradle in order to be portable (there’s no cord.) Because it’s not always plugged into power, always-on Alexa isn’t available though. You have to push a mic button to access the service. Tap is great if you’re going to the beach or are always on the go. Amazon’s Echo products are designed to be an access point to the Amazon Prime network. 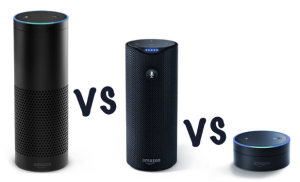 The monetization strategy is not really on the hardware of the Echo devices. Instead it’s really focusing on connecting users directly to the Prime network without having to go through an iPhone or Google search engine. And Alexa is the brain behind Echo. It’s smart because the more you use Echo, the more it adapts to your speech patterns, vocabulary, and personal preferences. And because Echo is always connected, updates are delivered automatically. Alexa also gives you based on the weather of the location you request it will recommend what to wear so that you don’t feel too cold or too hot, switch on the lamp before getting out of bed, turn on the fan or space heater while reading in your favorite chair, or dim the lights from the couch to watch a movie and order the right products that work with Alexa. The Google Home is centered on targeting users with ads. Google is one of the largest companies in the world to rely on ads as its primary stream of revenue. They garnered $79.4 billion from its AdSense division on its earnings, with the overwhelming majority of the Alphabet parent’s total revenue. While Alphabet bought the device makers Nest and Dropcam, Google Home doesn’t have the built-in user base that Apple has with iPhone. What does Google Home do? A simple voice request triggers Google Home to play music, podcasts or radio from services like Google Play Music, Spotify, YouTube Music, Pandora and TuneIn. Thanks to Google’s rich history in search, Google Home is ready for your questions. Get real-time answers including the latest on weather, traffic, finance, sports, local businesses – you can enjoy entertainment, manage tasks, plan your day, control your home, get information like nutrition information for ingredients or food or ask about current individual stock prices or current points of an index, like the NASDAQ or ask for scores, live updates, or next game date, location and time for your favorite sports teams. Their compatible smart home partners include nest, Phillips, IFTTT, WEMO, Honeywell and SmartThings. Streaming devices include: Google Chromecast, VIZIO, TOSHIBA, PHILLIPS, Sony, Bang and Olufsen, BO & Play, Grundig, polk, RUAMFELD. You can watch videos and photos on youtube, NETFLIX, and Google Photos. Download and run the Google Home app on a phone or tablet. It will be interesting to see who wins in the smart home race! What’s your choice? And why?